For decades, few people ventured into the deep hollows of the Cane Creek Nature Preserve in Tuscumbia: It was "big-time bootlegging country,” says Jim Lacefield, who manages the nature preserve with his wife, Faye. Aware of the dangers of moonshiners and bootleggers and their illegal goings-on, most locals steered clear of this remarkable swath of land. As a result, the area's remarkable waterfalls, canyons, and pockets of old-growth forest—sections of the preserve that have hardly changed since Paleo Indians occupied the land 10,000 years ago—remained a relative secret to many locals for quite some time. Eventually the bootleggers and moonshiners moved on, and in 1979, the Lacefields purchased 40 acres of land. Since then, they have expanded the preserve to include 700 acres with 15 miles of hiking trails. Here's how to do this history-rich adventure best: a 7.2-mile route with highlights that include a 60-foot waterfall, wild streams, rock shelters, and the ancient cove known as Devils Hollow. Before you hit the trail, be sure to sign in at the check-in kiosk (there’s no admission fee), and grab a map as well as a trail guide. Due to the large number of trails that loop through the preserve, it helps to have a map and written trail descriptions to keep you oriented. As you proceed from the preserve trailhead, follow signs for the Waterfall Trail. 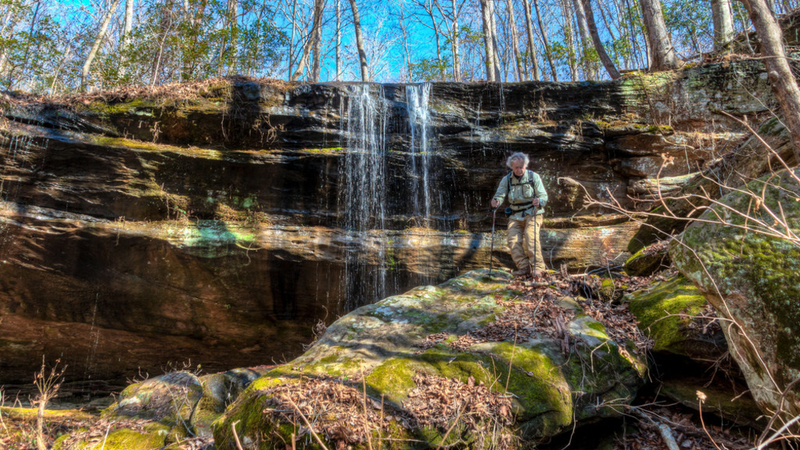 While the preserve is home to more than a dozen waterfalls, this path leads you to the largest one, where water drops 60 feet over a natural rock shelter and splashes into a narrow canyon. By following a narrow path on the side of the canyon, you can get a better view of the falls and descend to explore the shelter and canyon floor. In addition to waterfalls, the preserve also boasts some great views. From the top of the waterfall, climb steeply and continue to the “Point” overlook at the 0.3-mile mark. From this wide stone deck you’ll look out over a wide expanse of forest and see Red Rocks Ridge, which lies six miles to the north. From the Point, follow the signs for the Canyon Rim Trail and wind along the bluff’s edge, where occasional rock outcrops allow you to see the opposite ridge and distant hills to the north. In winter, when the trees are bare, this stretch of trail is even more impressive. Another great feature of the preserve is its collection of natural rock shelters formed by erosion. To reach one of the largest shelters, Tree Fern Cave, leave the Canyon Rim Trail to make a steep descent on gravel South Boundary Road trail. Located on your right as you descend, Tree Fern Cave is named for a fossil impression of bark that lies in the shelter roof and dates to the Coal Age some 300 million years ago. As you descend the Boundary Road and round a large bend, look for a side path on the right that drops down and leads to Tree Fern Cave. 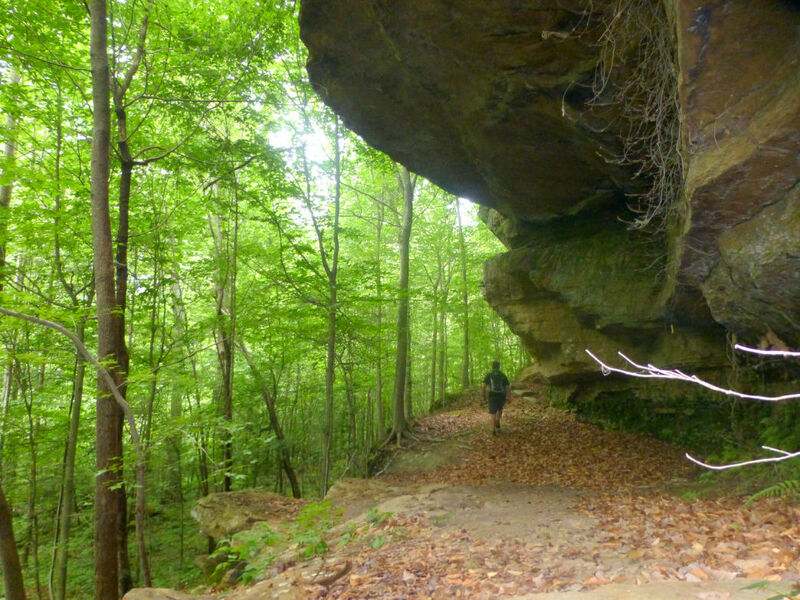 From Fern Cave, the trail plunges to meet the bank beside East Cane Creek. As you reach the bottom of the canyon, you enter a tranquil garden of tumbling streams, ferns, and wildflowers. Along the way, side trails lead to small cascades along the creek, where you can relax and enjoy the rushing water. If you hike this area in spring, keep your eyes peeled for wildflowers like trout lilies, phlox, and trilliumat at 1.3 miles, where you pass the Boulder Garden. Continuing on the East Cane Creek Trail, you’ll reach The Narrows just beyond the 2-mile mark. Here, Cane Creek rushes through a jumble of sandstone boulders, creating many pools and pockets surrounded by azaleas and mountain laurel. 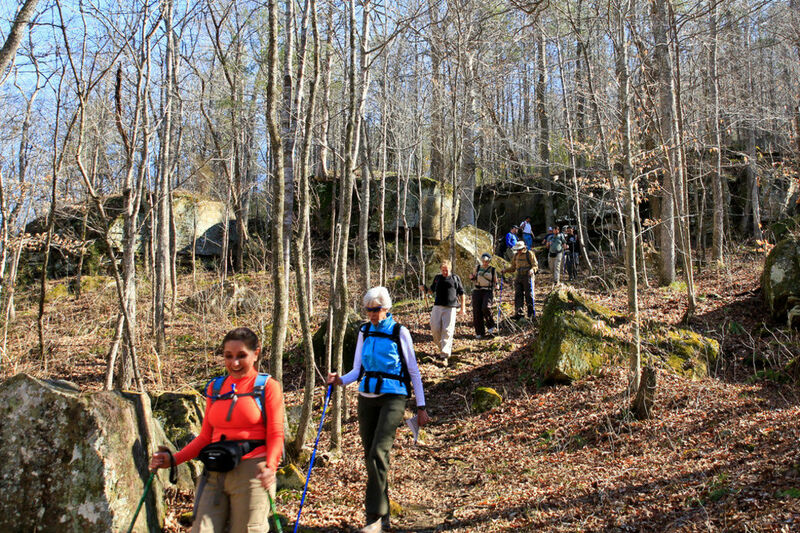 At 2.1 miles, a narrow, rocky trail on the left dives down to Blue Hole. 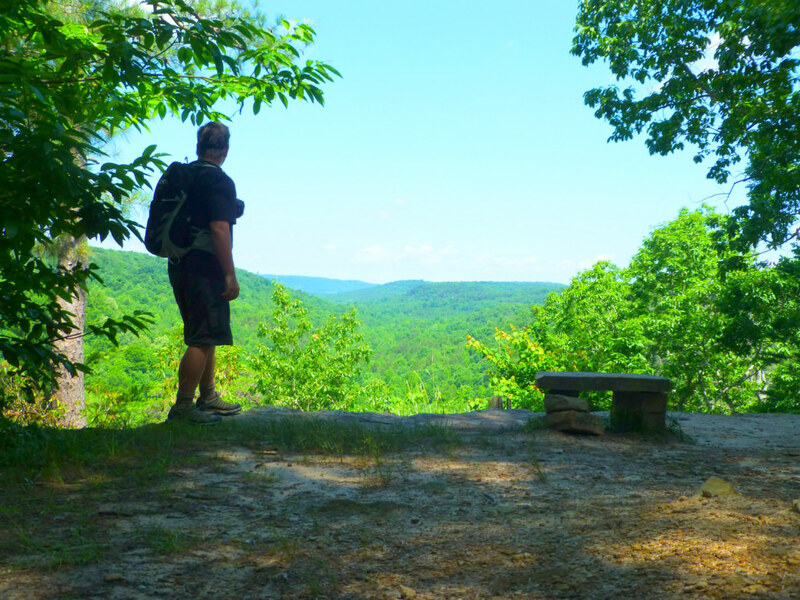 In this limestone glade, you can sit atop large boulders and watch turtles diving into shallow pools of clear water.After visiting Blue Hole, backtrack and climb the path that leads to one of the preserve’s most unique destinations, Devils Hollow. Over the years, surrounding bluffs have protected this Appalachian cove, and human impact has been minimal. As a result, Devils Hollow is home to rare flora, such as yellowwood trees, and in certain stretches you’ll encounter massive old-growth beech trees. As you move deeper into this box canyon, the tree canopy grows thick to obscure the sun and surrounding sandstone bluffs. Suddenly the temperature drops, and the cool winds and dim light create a slightly spooky atmosphere. Perhaps the moonshiners named this Devils Hollow to ward off visitors, but maybe the place just spooked them. 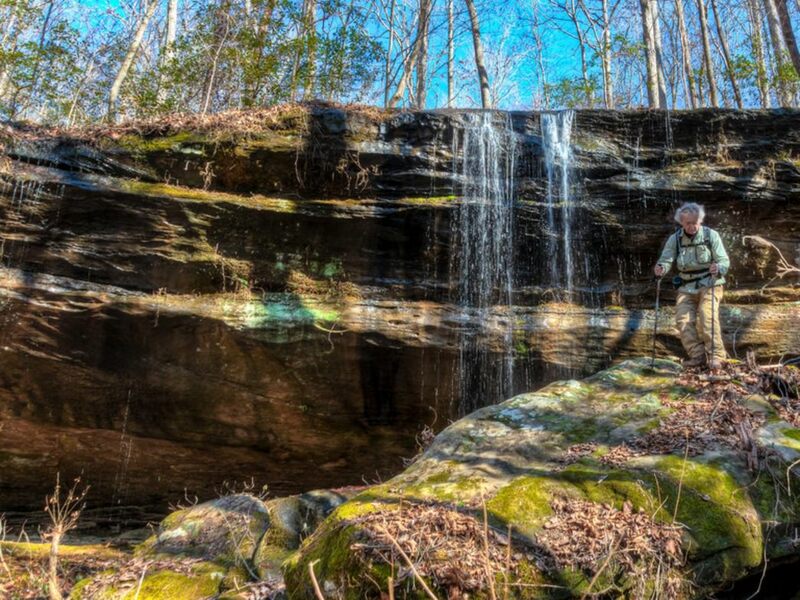 Continuing through Devils Hollow, you’ll pass Yellowwood falls, where water flows over a half-moon-shaped rock shelter into a small, clear pool. At 2.5 miles, the path reaches Karen’s Falls in the end of the box canyon. From the sunny woods above, a thin stream drops 30 feet into a shadowy alcove and glimmering pool. From Karen’s Falls, backtrack and turn right to climb the rugged Underbluff Trail, which creeps beneath sandstone ceilings. Over million of years, Devils Hollow Creek cut into the canyon to form these overhangs. While rugged Underbluff Trail adds some adventure to your walk, it also presents interesting geologic features. As you begin to walk along the rock face, you’ll see evidence of an ancient sea, including tidal channels from ancient barrier islands. As you progress, you actually move inland from the ancient sea and pass the remains of offshore sandbars. A little farther on, you walk by evidence of the ancient beachfront, and then sand dunes. After walking the ancient beach, a connector path will return you to the Devils Hollow Trail at the 4.2-mile mark. From this point, retrace your steps to the trailhead. From Tuscumbia, take U.S. Highway 72 West and turn left onto Frankfort Rd. Travel 7.5 miles and turn right onto Loop Road. Go 0.1 mile and veer left onto a gravel road and follow the Cane Creek Nature Preserve Signs to the Lacefield’s Spanish-style home. Parking is on the left, past the gazebo.